Water pollution is unusually common, and while it’s not something we think about frequently, recent issues in cities like Flint, Michigan and other areas around the country are bringing more attention to it. When almost 80% of the global wastewater supply is effectively dumped — untreated — back into the environment, it can be easy to understand why the potential for issues is high, and getting higher. 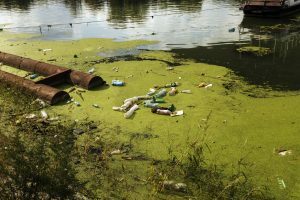 In this piece we’ll examine what constitutes common water pollution, some of the most common effects of that pollution, and what you can do to protect yourself and your home against it. Water pollution refers to any number of contaminants not normally present in water that enter the water supply through surface water exposure in lakes and rivers. Because water is a universal solvent, it is uniquely designed to absorb any chemicals and contaminants it comes in contact with, some of which can be harmful and hard to contain. Wastewater Pollution (including sewage, agricultural runoff, and fertilizers): can cause reproductive damage for wildlife in affected areas and contribute to increases in algae growth which disrupts the entire ecosystem. 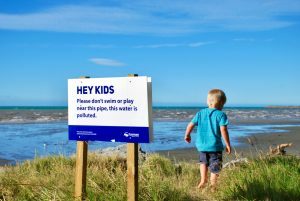 For exposed human populations – whether that exposure occurs via swimming, washing and bathing, or drinking and cooking —wastewater pollution can cause reproductive issues, rashes, stomach illness, even cancer and thyroid issues. Industrial Chemical Contamination: Chemicals produced as a byproduct in manufacturing can leach into water and accumulate in fish and other seafood. Depending on the specific chemicals in question, effects can vary from mildly harmful for human consumption, causing stomach irritation and upset to more severe and lasting issues like mercury poisoning (especially threatening for women and children). The EPA estimates that almost 1.2 trillion gallons of sewage from household and industrial sources is dumped into the nation’s water every single year, or about 3.28 billion gallons a day. Whole home water filtration systems — If you live in an area of the country where water contamination issues are common (you’ve experienced one or more boil orders, for example) you may want to consider installing a whole-home water filtration system. These types of filtration systems are installed at the point of entry to your home, so all the water that gets used in your home — whether that’s in the shower, kitchen tap, or washing machine, is filtered and fit for consumption. Point-of-use drinking water systems — Another option to protect your home from water pollutants can be point-of-use filtration systems that filter the water where you use it the most (typically the kitchen sink). It’s important to understand what kinds of contaminants the water filters you consider are designed to address. Some filtration systems, for example, are specialized to solve specific problems, like iron, arsenic, or sulfur contamination. According to the EPA, an estimated 10 to 20 percent of septic systems fail at some point in their operational lifetimes. Your local Culligan of Orange County can help answer any questions you may have about water filtration systems, and which types can work best to address the specific needs you have in your home, and your region.